If you're looking at gold miners, stop. You need to consider streaming companies like Royal Gold, Franco-Nevada, and Wheaton Precious Metals. The price of gold has fallen this year, which is a major headwind for gold miners. It is also one of the key reasons why investors should be looking at streaming and royalty companies like Royal Gold Inc. (NASDAQ:RGLD), Franco-Nevada Corporation (NYSE:FNV), and Wheaton Precious Metals Corp. (NYSE:WPM). They operate with a very different business model that shows its strength when times get tough. Miners have to find a location with gold, build a mine, dig up the gold, and then, when the gold has been depleted, close down the mine. Generally speaking, it's a complicated, dangerous, and expensive process. Streaming companies are a vital link in the gold mining process, but they don't get involved in any of the hard stuff. They just provide cash to miners, which gets used to build and run mines or pay down debt. In exchange, they get the right to buy precious metals at reduced rates in the future. The prices that streaming companies pay can be shockingly low. For example, Wheaton's average cost for silver is around $4.50 an ounce. For gold, it pays around $400 an ounce. That compares to realized sales prices of roughly $16.50 per ounce of silver in the second quarter of 2018 and $1,300 per ounce of gold. 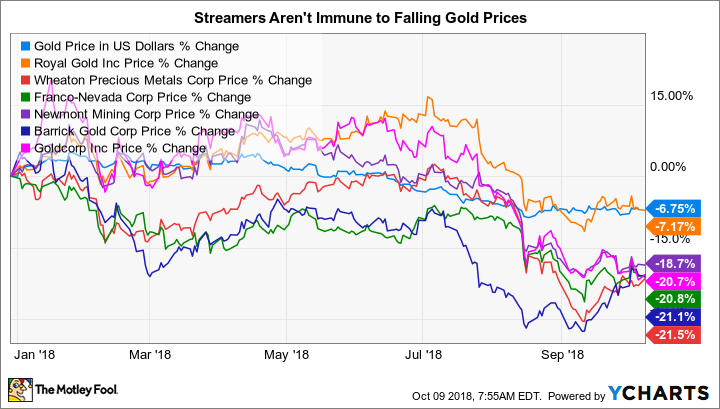 The key takeaway is the streaming companies have very wide margins, a fact that remains true in good gold markets and bad because their costs are usually set as a percentage of the spot price. 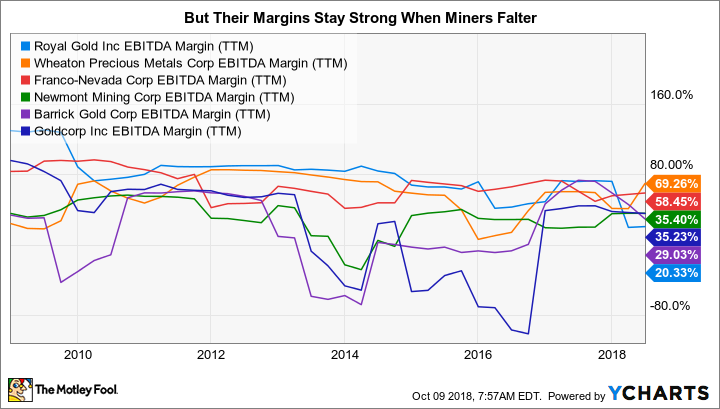 Miners often see their margins collapse (or turn negative) in bad markets because they have to adjust their operating costs, which is a difficult and time-consuming process. So while streaming companies have seen their shares fall right along with the price of gold and gold miners, their advantaged business model makes them a more compelling long-term investment. Royal Gold has been putting up very strong numbers despite gold's decline. In fiscal 2018, which ended in June, the streaming company reported record revenue, cash flow, and gold equivalent ounce production. Although gold prices have been weak, the company has a number of catalysts backing a solid outlook for 2019, including investments in three mine projects that are expected to start adding to revenue during the fiscal year. Note that these investments have already been made, so there's no new cash needed. Royal Gold just has to wait for the miners to complete the projects. Meanwhile, Royal Gold has been using extra cash to pay down debt so that it is better prepared to provide funding for new investments in the future. Debt fell by a huge 40% in fiscal 2018. That said, this move will help to protect the streamer's cash flow in the face of weak gold prices, too, since less debt means lower interest costs. Royal Gold is in a good position as it heads into a new fiscal year even if gold prices remain weak. Mine-specific issues have led to falling production at Franco-Nevada so far in 2018. Indeed, gold equivalent ounce production fell a painful 12% in the first half. However, the streamer still managed to increase adjusted EBITDA per share (up 1%) despite that headwind. The reason speaks to one of Franco-Nevada's core business approaches: diversification. Diversification comes in two forms at Franco-Nevada. It has more mine investments than either of its two major peers. But it also used the recent energy downturn to invest in oil and natural gas royalties. That business has been ramping up, more than doubling revenue year over year in the second quarter, a period in which energy accounted for 14% of the top line. The gains in this business have offset weakness on the precious metals side and highlight the value of Franco-Nevada's more diversified approach. That said, if you are looking for a pure-play metals company, this streamer wouldn't be the best pick. Franco-Nevada has no long-term debt on its balance sheet, so it, too, is in a very strong financial position. And with growth on the energy side expected to continue, it looks like this streamer can easily handle gold price weakness. Wheaton Precious Metals is the most focused of this trio, preferring to invest in a small number of large mines. The big story at Wheaton, however, is its shifting production mix. When the company first started out it was almost exclusively focused on silver. It has been increasingly adding gold to the mix, with a roughly even split between the two today. This effort is still showing up in the company's results, with silver production down 15% in the second quarter and gold production up 7%. However, gold is only one piece of the equation. So far this year, Wheaton has inked two new streaming deals, bringing palladium and, eventually, cobalt (expected to start adding to cash flow in 2021) into the mix. The company is projecting flat gold production for the full year and lower silver production, which isn't great news, especially if precious metals prices are weak. But this is something of a transition period for Wheaton, which expects to see growth in gold and silver production over the next five years as current investments pan out. And, on top of that, is the addition of the two new metals. Wheaton's shares have been hit harder than Royal Gold or Franco-Nevada's, but the shifting production mix is worth a close look. Although streaming companies will be impacted by lower precious metals prices, just like miners, they operate with very different business models. Locked-in low prices, usually set as a percentage of spot prices, helps protect margins. And each of these companies is making notable changes today to advance their businesses. Royal Gold's efforts to pare down debt should further protect margins and prepare it for a new round of investment when opportunities arise. Franco-Nevada's opportunistic oil investments are paying dividends right now. And Wheaton is continuing its effort to diversify, bringing in new metals that solidify its long-term production growth outlook. If you're looking at miners, step back and look at streamers -- you might find they are a better option for your portfolio.